I have that exact Estée Lauder still unused and in its box too, it's just too pretty to ever use! Girlfriend I feel you. It's like you read my mind and put down my thoughts. hahaha I love this post. This sounds like the sort of nonsense I tell myself. "This red is not the same as that, it is slightly…. more red." The phrase "Limited Edition" just gets ya, doesn't it? I remember feeling so gutted when I couldn't get my hands on the Archie Collection when in fact, I didn't really love any of the pieces in it. But boy, was I upset for the entire week then! Hahaha. This is so true! I'm trying to get better at it but it's so hard not to buy something. Love this post – I think i've said them all haha! Yep, I'm a hoarder! Haha, great post! I am definitely guilty of the "They are similar, but not the same" mindset. I mean, how many pink lipsticks does one need? All of them, obviously! Guilty of them all…especially number 10! "But it's sooooo pretty!" is usually the line I use, haha! Haha! This is hilariously true, guilty of most of those! Truth. The worst excuse is…but it was so expensive! I say that to myself all the time! Love the lipstick holder. Where can I buy one? Go to Amazon, search "acrylic lipstick holder." There are over a dozen to choose from. hahahah yes to all of them!!! and I always want to buy new launches or dupes to products i love and I tell myself that i need it because "what if it is sold out when I really needit?" It would seem that there are a LOT of beauty hoarders out there – and I thought it was just me!! Oh boy…sounds all to familiar, aznd I hardly ever go out to wear what I have accumulated. This post is hilarious. This sounds like the sort of nonsense I tell myself. Did you read my mind? Ha, I’m guilty of all of them! 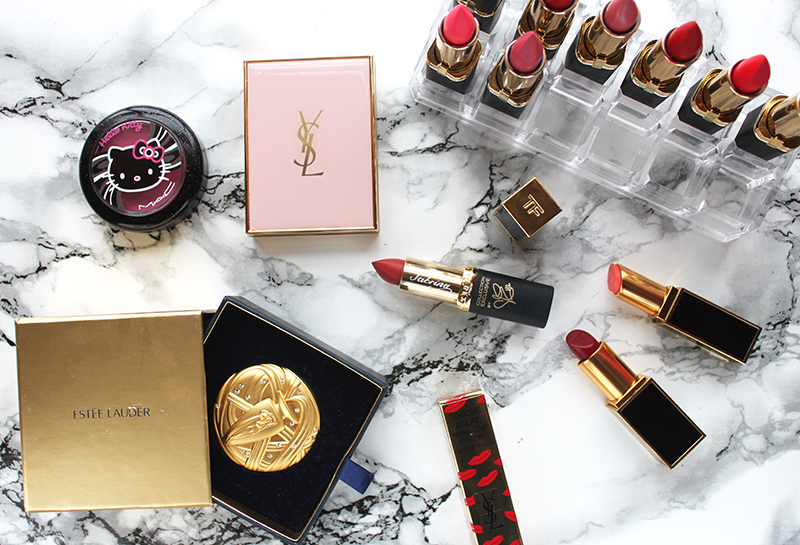 I especially tend to have a problem when it comes to limited editions – I want them all. The worst is it’s so expensive or rare so you should buy it…until it goes bad and you wasted it! But I’m a hoarder so can’t do much.